I have an endless supply of rocks in my yard. I may as well turn them into something pretty! After washing and drying, I drew hearts on my rocks with markers (some washable, some permanent). Then I gave then a coat of Modge Podge to seal the designs and shin-i-fy them. I'm planning on leaving these little love rocks around my neighborhood for unsuspecting people to find once the weather cooperates. I can't leave them in the snow, so it may be a while. Until then, I'll leave them here and wish you all a Happy Valentine's Day tomorrow! HOW SWEET! Love stones so must love your project!Thanks for sharing. You are the queen of frugal craftiness! So cute. I would be thrilled to find a love rock in my neighborhood. What a great way to spread some cheer! What a fantastic idea! I think my girls would love this and what a fun way to decorate our garden. These are really sweet. My daughter got a rock painting kit for her birthday and has really enjoyed turning something kinda drab into a beautiful work of art. New GFC Follower. Thanks for stopping by and leaving me a comment on the Baking Tip. I hope you'll visit again soon and maybe even follow me back. 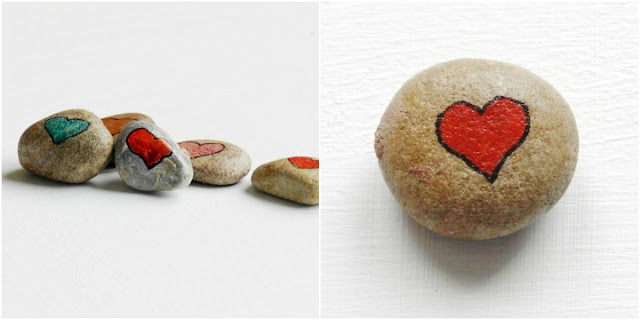 I LOVE the idea of leaving these little heart rocks around your neighborhood for folks to find. Way to infuse magic into someone else's day! That's something I would totally get into. As either the giver or recipient! Thanks for visiting my blog and commenting on my project! ;-) So fun to have met you. Now following you in bloglovin' so I can stay in the loop on all of your fantastic projects. I love these. I bought some rocks at the Dollar Store to make a game for my kids at school but I may use them for something else now!